When an award–winning investigative journalist, Loretta Schwartz-Nobel was assigned to investigate the epidemic surges in autism, birth defects, breast and lung cancers, asthma and clusters of other illnesses in cities and towns in the US, it began a chain of research that opened up to a frightening world of hidden contamination in the US and around the world. 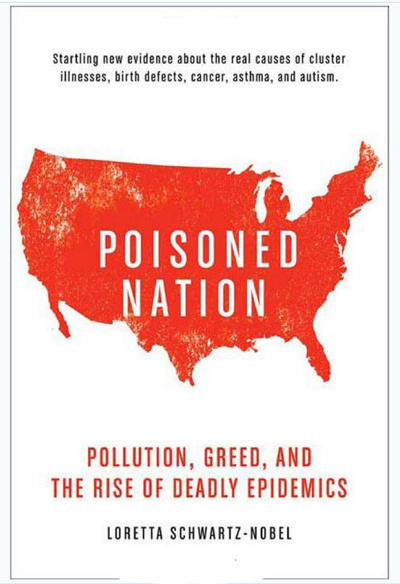 The book exposed the conspiracy of corrupt politicians, negligent regulators and greedy industry leaders covering up the epidemic of poisoned food, water and air that, the author claims, is filling up the hospitals, killing children and spreading cancer, birth defects, autism and leukemia. One particular area the author explored and exposed was the cluster of cancers (specifically leukemia) at most of the military camps in the US. At Camp Lejeune, North Carolina, she discovered that quite a number of children of the marines stationed there died from acute lymphocytic leukemia, which is known to be caused by either radiation exposure or drinking contaminated water. Schwartz-Nobel learned that for years the military had dumped highly toxic chemicals into trenches within feet of the base’s drinking-water wells. Elsewhere, crops including apples, potatoes, and spinach, raised on farms downstream from factories, were tested positive for carcinogenic chemicals in toxic amounts. Contaminated ground water just keeps moving and the contamination of ground water means the contamination of water everywhere. (So, how safe is Malaysia’s Lynas project??). The initial chapters of the book dealt with the dangers of contaminated ground water which goes on to form toxins in foods with the constant use of pesticides and herbicides that are sprayed on the grass or vegetables. Sometimes, the vegetables even acts as a concentrator to these chemicals. Scientists had long feared that these chemicals could end up in and perhaps even be concentrated in breast milk. In fact, in July 2005, a renowned non-profit organization known as the Environmental Working Group conducted a study on newborn babies in US hospitals. They found 287 industrial chemicals and pollutants in the umbilical cord blood taken from a sample of ten babies. These chemicals included pesticides, flame-retardants, chemicals from non-stick cooking pans and plastics. On average, each baby has been exposed to 200 chemicals even before they were born. Successive chapters in the book dealt with mercury as an airborne pollutant, and its role in the association between vaccinations and autism; and breast cancer in US women and the role of toxic compounds in the environment, and mammography-derived radiation, in causing this disease. Despite a global ban on methyl bromide, an acutely toxic chemical known to cause devastating birth defects, it is still being sprayed on Christmas trees, fruits, and vegetables sold in America. The EPA has refused to reveal the extent of methyl bromide’s use and the country’s stored supply of the product. The soaring epidemic of autism could not have taken place without the cooperation of drug companies, the government, scientists, and health officials. The worldwide poisoning of children during routine vaccinations continues today, especially in Third World countries. Many doctors and scientists have proven that the increase in autism is directly linked to the number of scheduled vaccinations babies received. Many of the vaccines contain a mercury additive called thimerosal, a dangerous, highly toxic preservative that stops contamination of vaccines and preserves shelf life at very low cost to drug manufacturers. (NB: All mothers with newly born babies or expecting mothers should read more about vaccinations). The FDA allows thousands of cosmetic hair dyes and personal-care products known to contain carcinogens to remain unregulated and to be sold daily to millions of American men, women, and children even as links with cancer have been clearly established. A wide range of personal care products, including shampoos, hair conditioners, cleansers, lotions, and creams, are dangerously contaminated with intense concentrations of the highly volatile 1,4 dioxane (a solvent), which is classified as a human carcinogen. The American Cancer Society and the National Cancer Institute have long known that mammograms used for diagnosis actually increase the risk of breast cancer, especially in younger women, yet they continue to recommend this diagnostic method. As Barbara Brenner, an activist and breast cancer survivor explained….mammograms do not prevent cancer. At best, they find it and at worst, they cause it. Mammography screening is a profit driven technology creating risks that are compounded by unreliability. …drug companies, in addition to profiting from cancer treatment drugs, sometimes also produce toxic chemicals that may be contributing to the high rates of cancer (in US) and increasing rates throughout the world. For fifty years, the truth about addiction and disease from smoking was deliberately hidden from the public….smoking is the single largest cause of premature death from chemical contamination in the US (and perhaps the whole world). Free samples are given to young children (as young as 7 years) and they become addicted to the cigarettes. The expense of giving away free samples to innocent kids all over the world is dwarfed by the long term economic gain through deadly addiction of yet another generation. About 80,000 to 100,000 young people are drawn in, tricked, then newly addicted to the chemicals in tobacco everyday and 4.9 million people die every year from tobacco-related illnesses. This is the equivalent of approx 35 jumbo jet planes crashing everyday of the year!! Cigarette manufacturers purposely use special chemical additives to make cigarettes that provide extremely high levels of “free” nicotine, in order to increase the addictive speed…the additives are also used to enhance the taste of tobacco smoke. The addition of flavorings is designed to make cigarettes more appealing to children and other first-time users. Some of the additives are toxic or addictive in their own right or in combination. When these additives are burned, new products are formed, and these, too, may be toxic or pharmacologically active. Even people who don’t smoke are placed at much more extreme risk for lung cancer and other illness from contaminated air than we are led to believe, especially children and women. Nonsmoking women increase their lung cancer risk by 24 % when they live with a smoker….their risk is increased by 39 % when they work with people who smoke and an astounding 50 % when they hang out with smokers in such social settings as bars and restaurants. Dana Reeve was one such case. A singer and actress, she was married to Christopher Reeve aka Superman. In Aug 2005, Dana was diagnosed with lung cancer. Although a non smoker all her life, Dana was exposed to secondhand smoke in the clubs she sang at. Eight months later she was dead despite all the scientifically tested chemotherapy drugs she was treated with after diagnosis. Hence it is not difficult to understand why lung cancer has reached such pandemic proportions in America and worldwide. From the above summary, the title of the book is most apt to describe America….a POISONED NATION. But honestly, we feel Malaysia is not very far away in achieving the poisoned nation status. What do you think? SILENT SPRING…Rachel Carson’s Silent Spring was first published in three serialized excerpts in the New Yorker in June of 1962. The book appeared in September of that year and the outcry that followed its publication forced the banning of DDT and spurred revolutionary changes in the laws affecting our air, land, and water. Carson’s passionate concern for the future of our planet reverberated powerfully throughout the world, and her eloquent book was instrumental in launching the environmental movement. LIVING DOWNSTREAM by Sandra Steingraber, a biologist, poet, and survivor of cancer in her twenties, brings all three perspectives to bear on the most important health and human rights issue of our time: the growing body of evidence linking cancer to environmental contaminations. Her scrupulously researched scientific analysis ranges from the alarming worldwide patterns of cancer incidence to the sabotage wrought by cancer-promoting substances on the intricate workings of human cells. POLLUTANTS, HUMAN HEALTH AND THE ENVIRONMENT by Professor Jane Plant is a comprehensive, up-to-date overview of environmental pollutants that are of current concern to human health. Clearly structured throughout, the main body of the book is divided by pollutant type with a chapter devoted to each group of pollutants. Each chapter follows a similar format to facilitate comparison and discussion. For each pollutant, the authors describe the sources, pathways, environmental fate and known toxicological effects.